First off, I have to say that I was ABSOLUTELY RELIEVED to find out that this is, in fact, the first book in a series – I did not want to say goodbye to these characters. I picked it up from the library on a whim, and was so glad that I did. I now have a hold placed on Lair of Dreams (book #2), and can’t wait for my turn to listen to that one too. Evie O’Neill is a seventeen year old flapper with a gift – the gift of “reading” an object to discover its owner’s secrets. After an impromptu reading at a party gets her in trouble at home in Ohio, she is sent to live with her Uncle Will in New York. Her uncle runs a museum of the paranormal, and is called in by the police to help look into a string of unusual murders. Hoping to secure a permanent place in New York, Evie joins her Uncle Will’s team and helps investigate. 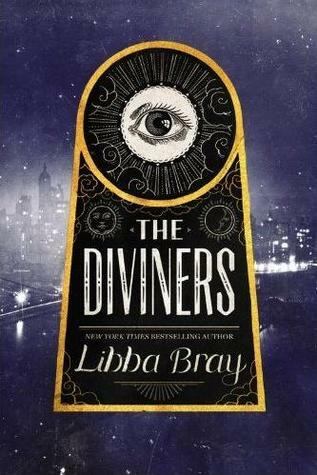 Libba Bray has done a wonderful job of transporting the reader back to 1920’s New York. I could almost see the flapper dresses and cloche hats, and hear the music and the clinking of glasses in the speakeasy clubs. The book would be worth reading for the glimpse into the past alone, but it has so much more to offer. Mystery, danger, secrets, powers, music, romance – I could go on and on! I listened to this book, rather than reading a print edition, and I would highly recommend it. January LaVoy did an amazing job of bringing each character to life with his or her own voice and inflections. This was no small feat considering the size of the cast of characters she had to work with! I hope she will continue to read the rest of the books in this series as they are published. If you’ve read The Diviners, I’d love to hear your thoughts! The historical setting sounds amazing! I will definitely try to listen to the audiobook version of this one – thanks for the tip. This is one of those series that I’ve been meaning to start for a while, but your review has convinced me that “sooner rather than later” might be good in this case! Glad you loved The Diviners. It was such a nice surprise…I’d never heard of it before picking it up from the library! This is LB’s 2nd series and I haven’t read either one yet, despite all the lovely reviews out there. I shall give it a go this year though! I will have to look for the other one.